An important question regarding orientation selectivity (OS) in the primary visual cortex (V1) is to know how OS varies among different V1 neural populations and throughout V1 layers [1, 2]. In this work we present a large-scale model highly constrained by physiology and anatomy and use it to address these questions. The model corresponds to 4 mm2 of cortical area in a 10:1 scale. It is composed of 59,821 cells arranged into six layers (L1, L2/3, L4B, L4C α , L5 and L6) representing the M pathway. Six different HH-type neuron models were constructed to simulate six different cell classes: late spiking, non-late spiking, fast spiking, regular spiking, chattering, and bursting neurons. These neurons were distributed in the six layers in a realistic way with short- and long-range intra-laminar connections as well as inter-laminar connections. Thalamic inputs are delivered to all excitatory cells in layers 4C α and 6. Activation of a cortical cell is modeled by a convolution of a sinusoidal drifting grating with a Gabor function. Neural OS profile was determined via circular variance and half-height bandwidth of its tuning curve. Neurons in the model show a diversity of OS consistent with experimental data (see Figure 1). 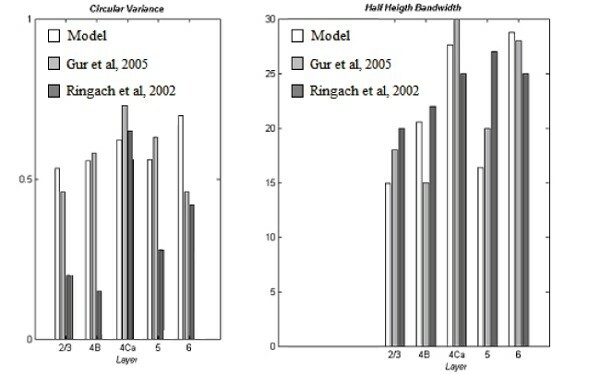 Comparison of the OS profile shown by the model with experimental results. Results suggest that the diversity in OS observed across cortical layers is at least partially due to heterogeneity in cellular electrophysiology and circuitry properties. Supported by grants from FAPESP.